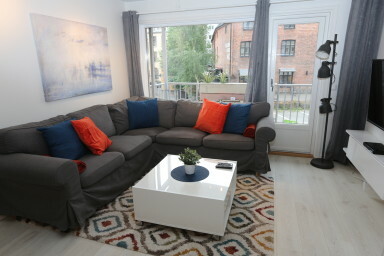 This newly renovated, high standard flat by Sonderland Apartments is located in the heart of Oslo. Only 4 blocks away from The Royal Palace and Karl Johans gate, Oslo's main pedestrian street with restaurants and shopping. In walking distance of The Akershus Fortress, The National Theater and Aker Brygge, known for its restaurants along the boardwalk, boat life and unique outdoor areas. This self-catering apartment decorated in tasteful and modern design has 4 bedrooms that can accommodate up to 10 guests. There is a total of 8 single beds and one king-sized bed, all very comfortable and with soft duvets. It has a living/dining room area with a sofa and big flat screen TV, and an open kitchen equipped with kitchenware, an electric stove top, an oven, a fridge with freezer, a dishwasher, toaster, microwave and a coffee machine. There are two bathrooms, each with a shower, and a washing machine and dryer. It has a balcony with a small seating area. Wi-Fi is free of charge, and there is an elevator in the building.